Things are just heating up at Slotorama and they're about to get even hotter in the spicy new 50-payline Jumpin Jalapenos slot machine from WMS! Things are just heating up at Slotorama and they’re about to get even hotter in the spicy new 50-payline Jumpin Jalapenos slot machine from WMS! Originally released by Konami for land-based casinos, WMS have now taken control of this game and brought it online for all of its fans. The slot’s appearance has a truly Mexican feel to it while the sounds are very traditional slot machine sounds. Are you ready yet to fire up the excitement? The game has a unique 4-5-5-5-4 reel layout to house it’s 50-paylines. On the reels you’ll find a steaming hot red bull, a guitar, a Mexican compound, a cactus, a pair of chili peppers, a Mexican man and a taco. The traditional card symbols 9 through Ace also make an appearance on the reels. Two Wilds – The Jalapeno pair and the Mexican man are both wilds in the game. The Jalapeno will appear on reels 2-4 only while the Man will only appear can appear on all reels and will substitute for all symbols except the Jalapeno. 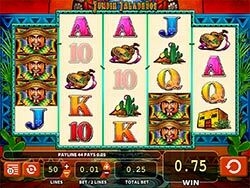 Hot Free Spins – Things get fired up when you hit three or more Jalapeno symbols on the reels. Get that and you’ll win yourself 12 Free Spin!